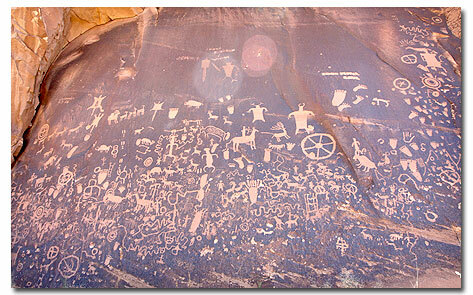 Newspaper Rock is a petroglyph panel etched in sandstone that records perhaps 2,000 years of human activity in the area. 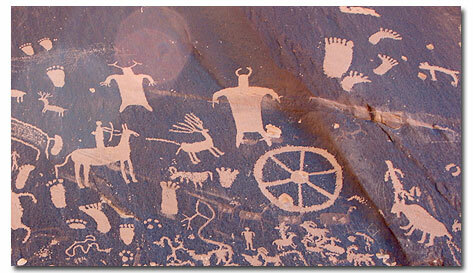 Etched into the desert varnish are symbols' representing the Fremont, Anasazi, Navajo and Anglo cultures. The exact nature of these symbols meaning is still not clearly understood. 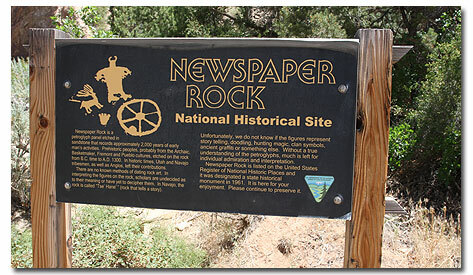 But they are typical of many sites throughout the U.S. in their use of universal symbols, be it graffiti or a true "newspaper," recording events of the times and earlier. The area is right next to Utah Route 211, 24 miles northwest of Monticello on the main road into the Needles section of Canyonlands National Park. It is usually bypassed by travelers hurrying elsewhere. 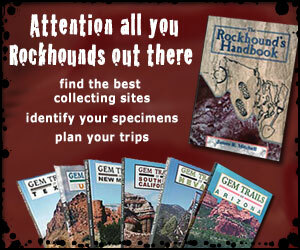 They are missing one of the finest displays of Indian rock art to be found anywhere in the U.S. 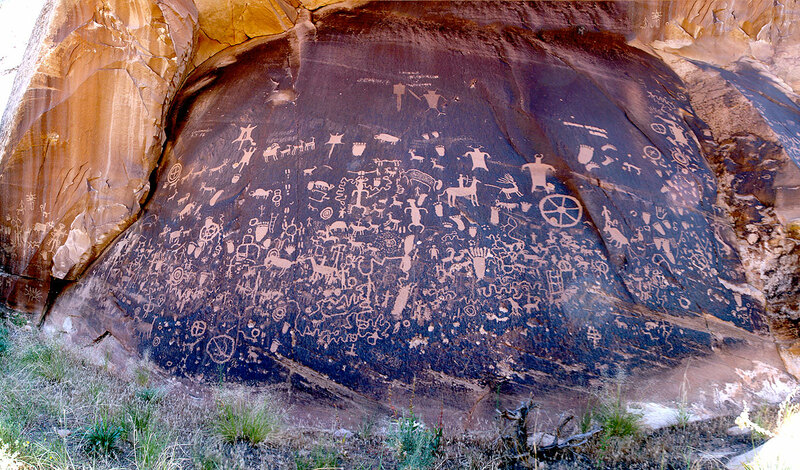 This is also one of the few petroglyph sites that is so easily accessible and can be viewed and that photographed at close range. 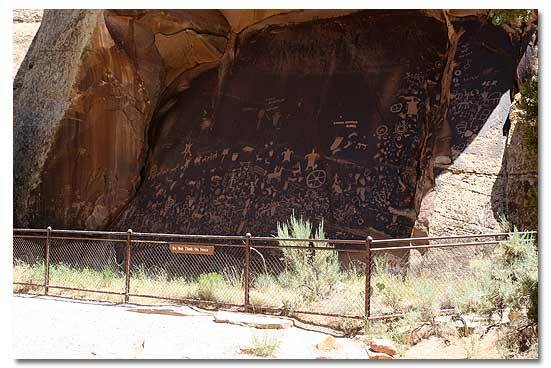 There is no camping in this area, the old campground across from the Newspaper Rock is closed. Camping there is now illegal. Moab, Utah: 50 miles north. Blanding , Utah: 48 miles south. Monticello , Utah: 24 miles southeast. Cortez, Colorado: 84 miles east. Canyonlands National Park (Needles District): 23 miles northwest. Arches National Park: 61 miles north. Hovenweep National Monument: 115 miles east. Natural Bridges National Monument: 88 miles southwest. Mesa Verde National Park: 94 miles east. Goosenecks State Park: 85 miles south. Edge of the Cedars State Park: 48 miles south. Glen Canyon NRA (Bullfrog Marina): 153 miles southwest. Glen Canyon NRA (Hite Marina): 123 miles southwest. Manti-La Sal National Forest: Adjoins the park. Butler Wash Ruins Overlook: 57 miles southwest. Mule Canyon Ruins: 63 miles southwest.